About 100 seniors attended the 55th Anniversary meeting at the Senior Center. A television was donated during this meeting by the Meadowlands Rotary Club and Fundi Manufacturing. Coffee and cake was served by the Key Club. 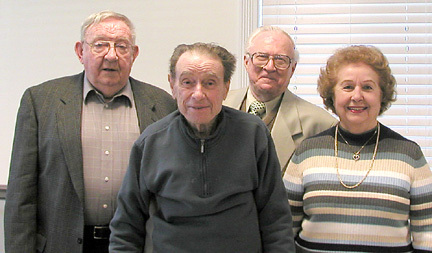 On April 13, 2005, the Leisure Club of Hasbrouck Heights celebrated its fifty-fifth anniversary during its monthly meeting in the new Senior Center located on the first floor of the Municipal Complex. Who would have thought that the informal meeting of a group of women in early 1950 would develop into a club that would last this long. The purpose of the club then was only to promote good fellowship among all seniors. Todays Club serves as a forum for the exchange of ideas among senior citizens. It strives to provide information on issues concerning senior citizens as well as offer congenial and cooperative activities that will be of interest to its members. At monthly meetings, entertainment with coffee and dessert are provided. The entertainment ranges from talks about health care, what special services are available to seniors and other general information. There are also programs presented by musicians, vocalists and senior citizen dance groups. In the last two years, week long trips have been as far north as Cape Cod, Massachusetts, and as far south as Savannah, Georgia. This year a trip is planned for Niagara Falls, Canada. Many day trips have been taken to such places as the Villa (formerly Evergreen), Rudys Beau Rivage, and the Hunterdon Hills Playhouse. Along with lunches, seniors were treated to entertainment as well as off-Broadway shows. The new Senior Center has been a place for all seniors to enjoy varied activities and luncheon parties. They have been planned by Director of Recreation Robert Brady to encourage senior participation. Some regular activities are line dancing, bingo, yoga, aerobics and movies. Free health consultations are available once a month and the Board of Health sponsors health fairs semi-annually. The Leisure Club "Senior Citizens" of Hasbrouck Heights was organized on April 18, 1950 under the auspices of the Borough of Hasbrouck Heights Recreation Commission. Membership then, as it is now, is open to all residents of our borough age 60 or older. The meetings were held on a monthly basis in the various church halls. Meetings were hosted by one of the various clubs, organizations or religious groups in our community who also furnished refreshments and entertainment at the meetings. In 1982, arrangements were made with the pastor of Corpus Christi Church to use the school cafeteria for the monthly meetings. The club applied for, and received, a Certificate of Incorporation from the State of New Jersey on July 5, 1984 under the new name of "The Leisure Club of Hasbrouck Heights, Inc."
In January 2004, the Club moved to its present location, "The Senior Center", in the Municipal Building. From its beginning and to this date, the Recreation Department has helped to subsidize many of the recreational and social activities of the Club. The past presidents were Oakley Adams, Julia Henne, Ruth Mc Levdege, Gladys Carter, Marge Kren, Joseph Cairns, Louise Putzer, Jerry Pignata, Michael Cahill, Rose Mulle, and Robert Zappatelli. The present officers are President John Fitzin, Vice President Peter Gallo, Treasurer Dorothy Fitzin and Secretary Connie Stanzione. l-r Past President Michael Cahill, oldest past President Joseph Cairns, current President John Fitzin and past President Rose Mulle. 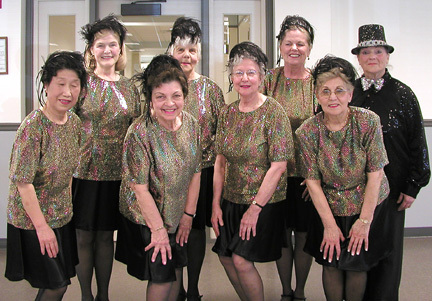 The "Happy Tappers" (who are lively dancers over 60 years old from Demarest, NJ) provided the entertainment to an appreciative audience.